The St. Louis Cardinals have made sure all-star weekend gets off to an interesting start. Well, unless your manager Mike Matheny. 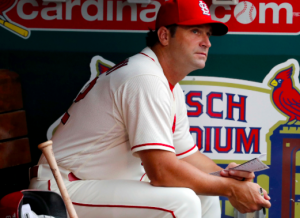 The Cardinals fired Matheny Saturday night following the team’s loss to the Reds. Hitting coach John Mabry and assistant hitting coach Bill Mueller have also been let go. Bench coach Mike Shildt has been appointed as the interim manager. The timing of the move is a little curious. Unless the Cardinals plan to use the all-star break to find a new manager, which seems unlikely, they could have easily waited until after Sunday’s game. It doesn’t seem sensible to install Shildt as the interim manager one day before the team disperses for the break. Nevertheless, the Cardinals didn’t want to wait another day to make a change. Matheny was hired by the Cardinals prior to the 2012 season to replace the legendary Tony LaRussa. He had no previous managerial experience but was well respected after spending more than a decade as a major league catcher. Matheny led the Cardinals to the NLCS as a wild-card in his first season. That was followed by three consecutive division titles, including a World Series appearance in 2013. During the 2016 season, Matheny was given a contract extension through the 2020 season. Alas, that is when things started to turn south for Matheny and the Cardinals. The Red Birds finished a distant second in the NL Central in 2016. They also missed out on the playoffs altogether following a tight wild-card race with the Mets and Giants. St. Louis also missed the playoffs last year, finishing 83-79 and third in the NL Central. The Cardinals are now in danger of missing the playoffs for the third straight year. That hasn’t happened in St. Louis since 1999. Saturday’s loss dropped the Cardinals to just one game over .500. They begin Sunday 7.5 games behind the Cubs in the NL Central and four games back in the wild-card race. However, with the Cardinals 5-10 in their last 15 games, they don’t appear to be making much progress in the playoff hunt. St. Louis will likely look for a full-time replacement during the offseason. In the meantime, it appears to be on Shildt to get things turned around and get the team to the playoffs. Shildt has some managerial experience in the Cardinals minor league system. But this will be his first time as a big league manager. Shildt will be tasked with taking a team that’s been plagued by injured pitchers and underperforming stars like Dexter Fowler and Marcell Ozuna and finding a way to get to the postseason. Matheny’s firing seems to be a move of desperation to kickstart an underachieving team. Of course, whether it’ll be enough to change the Cardinals’ fortunes this season remains to be seen.